Very high quality, colored, two-component epoxy floor paint, with high color opacity, which hardens high percentage cross-linking to a durable floor, permeable for groundwater vapour. Applied in two layers creates an excellent, abrasion and chemical and slip resistant floor surfaces in indoor and covered outdoor areas, which can be re-used quickly. Can be applied in work areas, industrial halls, garages and hobby rooms. It is possible to sprinkle Eurocol acrylic color flakes (for special decorative effect) into the wet top coat. The sprinkled coat has to be sealed with a suitable transparent Eurocol PU coat to protect color flakes from peeling up and collecting dirt. 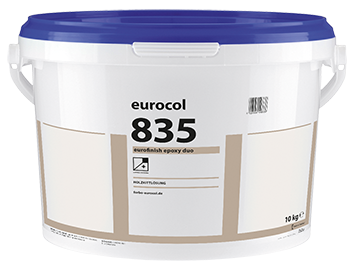 The Eurocol PU coat improves the scratch resistance and acts as a sacrificial layer. Suitable over underfloor heating systems. Shipped in silk-matt, pebble gray RAL 7032. Drying time: approx. 12 - 16 hrs.